because they’re the only ones that count. Dedication is what separates success from failure. In sales, you must learn to be 100% dedicated to what you’re doing. You have to be dedicated in a way that sets you apart from everybody else. Your hard work and dedication can propel you to a level you cannot imagine. Most people go through life, simply giving up when things don’t work out. Dedication is what sets you apart from everybody else. We all know negative people. They come into work negative, constantly unhappy, acting like everything around them is everyone else’s fault and that’s why they cannot succeed. They are no longer dedicated. You have to have a straight path that you constantly pursue, and truly believe that if you dedicate enough time and effort, you will become the best. Many salespeople do not have sufficient dedication. They don’t immerse themselves. They don’t go all the way in. Like Texas Hold ‘Em, if you want to win, you have to be all in—all or nothing. Not once in a while, but all the time. This is what true dedication is all about. We have obstacles thrown at us every day. Overcome them and move forward. Focus on your dedication to your job and your career! 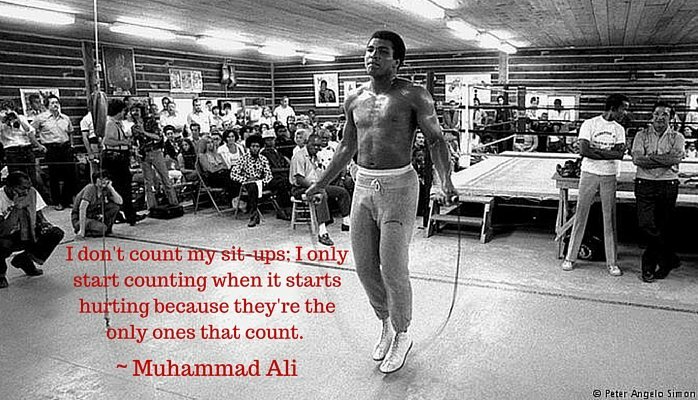 Focus on your goals, despite your failures, just as Muhammad Ali focused more on his goals when it hurt.